MONTREAL – Montreal Canadiens General Manager Pierre Gauthier announced Thursday the signing of free agent forward Hunter Bishop to a two-year contract (2010-11 and 2011-12). He will report to the Hamilton Bulldogs on Monday. Bishop, 22, a 6’, 196 lbs forward native of Fairbanks, Alaska ranked fourth in scoring in his second season with the NCAA Ohio State Buckeyes this season. He registered 27 points in 33 games (15 goals, 12 assists). He ranked third in goals and had 22 penalty minutes. In his sophomore season with Ohio State in 2008-09, Bishop ranked third in scoring with 31 points in 42 games (14 goals, 17 assists). From 2005 to 2008, Bishop registered a total of 177 points (93 goals, 84 assists) in 140 regular season games with the Vernon Vipers of the BCHL (British Columbia Hockey League), including a 97-point season (57-40-97) in 2007-08. 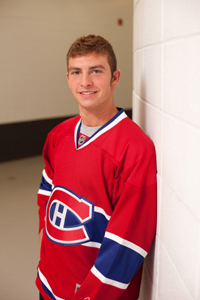 Bishop participated in the Canadiens’ development camp in 2009.